Cover art from Fraidy Zoo by Thyra Heder, Abrams, 2013. 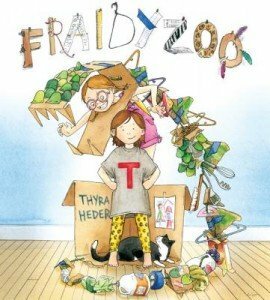 Fraidy Zoo, by Thyra Heder (Abrams Books for Young Readers, $16.95, Ages 4-8), is reviewed today by Cathy Ballou Mealey. What would you do, if you were afraid of the zoo? If you weren’t sure why, then what would you do? This is an inventive, alphabetized romp through the efforts of a highly creative family trying to help the youngest member get over her fears about visiting the zoo. Kids will giggle and roar at the clever ink and watercolor illustrations that depict a menagerie from A to Z constructed from ordinary household items. Silly Dad adorns himself with a pink tutu, pink socks, and pink sticky notes to question whether Little T is afraid of flamingoes. Sister suggests that perhaps it is parrots by sporting a green turban, soda can, and terry towel wings. With cardboard, newspaper and miles of tape, the entire family even recreates bigger critters like a rhino, snake and T-Rex. Lively, captivating dialogue moves the story along at just the right pace, while subtle jokes and hints abound. Even after young readers have guessed all of the animals, they’ll want to re-read the story to find the sweet black and white cat hidden on every page. A tiny twist at the end will surprise and delight readers, and reinforce the idea that it is easier to face your fears when you rely on the love and support of those around you. Give this charming and witty book as a gift with a few rolls of tape, and Fraidy Zoo fans will enthusiastically recycle your holiday boxes and wrappings into an incredible assortment of creative creatures! 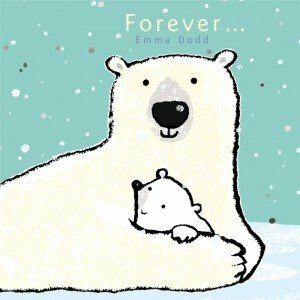 Forever, by Emma Dodd (Templar/Candlewick Press, $12.99, Ages 2-5) is reviewed today by Cathy Ballou Mealey. Add Forever by Emma Dodd to your holiday gift list! From Templar/Candlewick Press, 2013. Perfect for reading and snuggling at bedtime, this is a sweet and simple book for parent and child to share and enjoy. In a vast white Arctic wilderness, this engaging bear pair plays, cuddles, swims and sleeps side by side. The quiet, comforting text assures little bear that his parent will always be there to encourage, reassure, and guide him. Spare but captivating prose perfectly carries the story forward through the book. 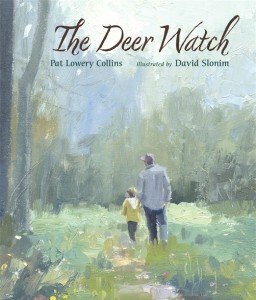 The illustrations are both muted and show-stopping, so lovely that you must pause and appreciate the scale and setting on each page. 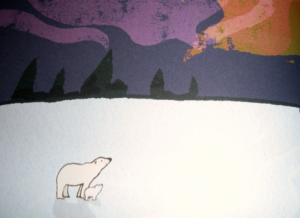 We see the bears close and cuddling, but also venturing through their snowy home beneath the Northern Lights, under swirling snowflakes, or paddling through a brilliant silver sea. Foil softly enhances the scenes as sparkling stars, moon, snow and water, adding an extra dimension of depth and interest. 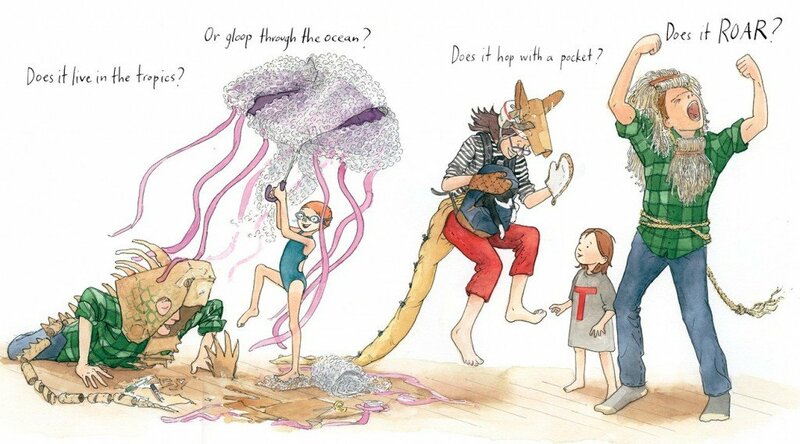 Interior artwork from Forever by Emma Dodd, copyright 2013, Templar/Candlewick Press. The sweet-faced little cub absorbs the calm and steady wisdom of his parent throughout the tale, whether happy, blue, worried or hopeful. 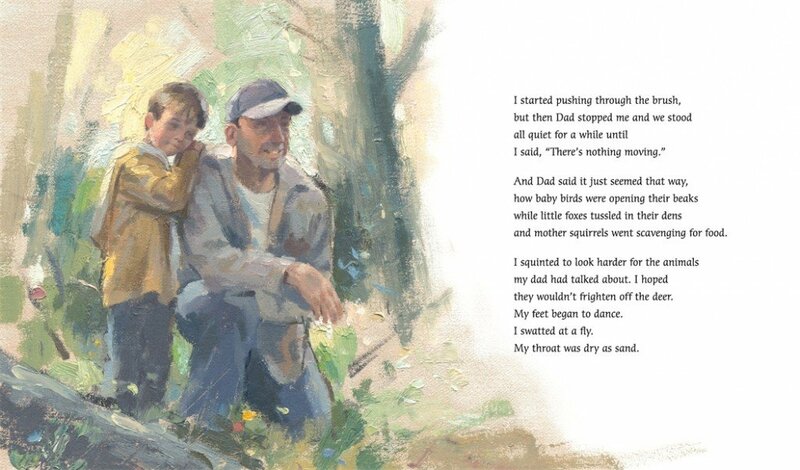 Ending with the enduring promise that (“No matter what may come as we journey on together…know that deep within my heart, I will love you…forever.”) this tale will be a warm and lovely bedtime favorite.